A 1960s American relic has, 40 years later, reached Armenia. No, I don’t mean Cher. But I am talking about something plastic: Pez. It is the little things that make me happy. And you don’t get much littler than the tiny candy that this week made it into Yerevan markets with Disney characters on the front and product information written on the back, in Russian. I bought “Tigger”, grape flavored, for 400 drams. An 80-cent bargain. Change will come through the barrel of a Pez..
Like the Hula Hoop and the Frisbee and, much later, Cabbage Patch Dolls, Power Rangers, Teletubbies . . . Pez defined a generation on its way to becoming an icon. There are web pages devoted to Pez. There are Pez collectors. There are entire conventions devoted to Pez. Now, Armenia is on the Pez map. Hoorah. It happened in the same week as a new restaurant put up a sign 100 meters off Republic Square. The new restaurant, a kalbasa’s toss from where the statue of Lenin was prostrate in the yard of a museum in the heady days before independence was understood to mean self-reliance, is called “CCCP”. That’s USSR to the English speaking world. The restaurant’s logo is a hammer and sickle. American kitsch and communist nostalgia fighting for the same Armenian dram is a bellwether moment I’m happy to witness in this sociological Petri dish of a place. 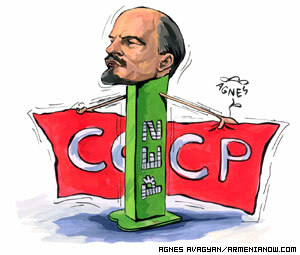 The market potential of Pez in a child-friendly republic notwithstanding, CCCP has an early lead. Also recently, a new clothing line, CCCP Sportswear, came to town, with its logo on plastic bags – close enough to a stamp of legitimacy in a city where “Gapland” mimics the real thing, and “McDuk” and “Queenburger” are landmarks. It isn’t right that the Armenians, with so much of their own culture to exploit, should miss out on their share of the Pez windfall. So I have an idea . . . Recycle Pez, as sunflower dispenser. If you know this country, you know that it is a society fueled by sunflower seeds. Sidewalks are paved with the disgorged black shells of a billion seeds consumed by a culture at ease with itself. The habitual movement of hand-to-seeds-to-mouth is the motion of a people spitting, literally, in the face of social decorum. I’ve researched this, and have determined that the size of a Pez candy and the size of an Armenian sunflower make the newly-arrived iconoclastic dispenser compatible to either – a multi-tasking wonder. If Armenian ingenuity is as claimed, the day can’t be too distant when we’ll see a knock-off Pez with the tilted back head of hero Vartan Mamikonyan at your service. Or the Pez version of the Mother Armenia statue loaded and ready to dispense the National Seed. Superheros of Pez? Forget Spiderman or Wonderwoman. Show me a Sasuntsi David series, and that’s a collection I’m ready for my kid to start. If I had one. A kid I mean. Which I don’t. Otherwise, cultural phenomena aside, the arrival of a toy-candy collectible might not be so amusing. Even at 400 drams per bilingual package.